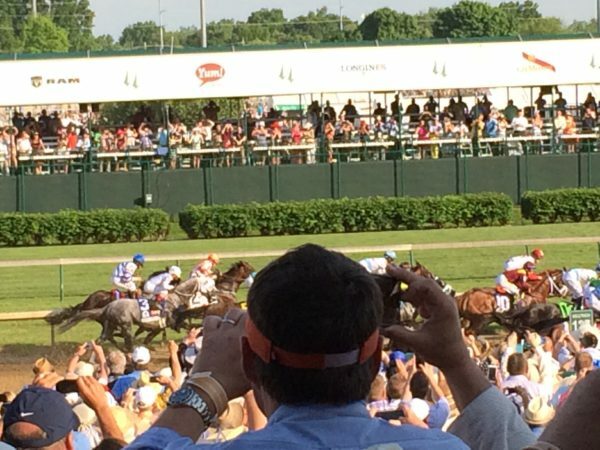 Last month I wrote about our impending trip to the Kentucky Derby, something that has been on my bucket list for years. I’m here this month to share some of the highlights and low lights of my experience. As an author there is nothing better than going somewhere and people watching. 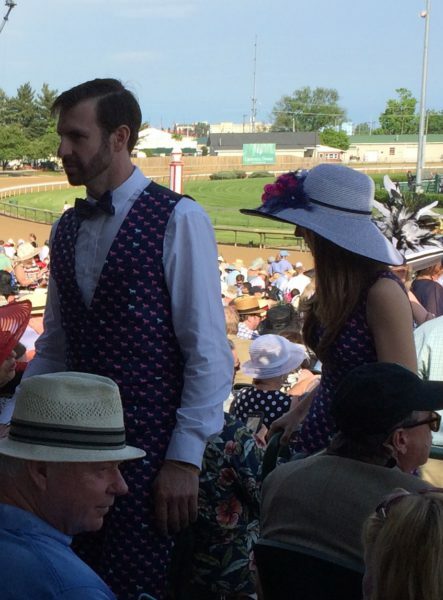 The Kentucky Derby is ready made for that very thing. 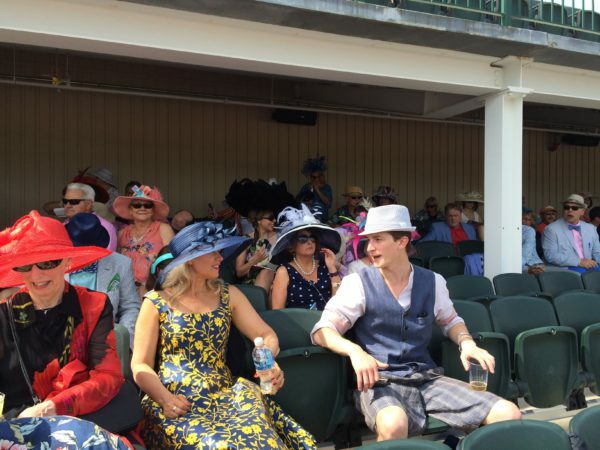 In my last post I shared my dress and shoes and a link to a picture of my Kentucky Derby hat. My hat was perfect because I could squish it down to fit in my suitcase, and it popped right back into shape as soon as I took it out. I didn’t have to carry a hat box on the plane. Here I am dressed in my outfit alongside my husband as we arrived for our big day at the Derby. 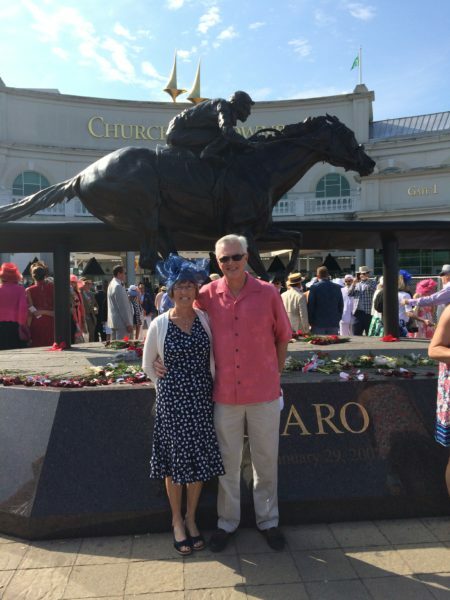 People were lining up to have their photos taken in front of the statue of Barbaro, a Kentucky Derby winner that had to be euthanized after an accident in the Preakness, the second race in the triple crown of horse racing. My dress was covered in white daisies. Maybe it should have been roses or horses like this couple. When I saw their outfits, I had to take photo. I’m going to post the photo even though at this size, you might not be able to tell that there are horses all over her dress and his vest and pants. Just as we arrived, they were unloading the garland or blanket of roses that they put across the winning horse at the end of the race. I never thought about where the roses are kept or how they are made until we attended the race. The Kroger company makes the garland at one of their local stores. 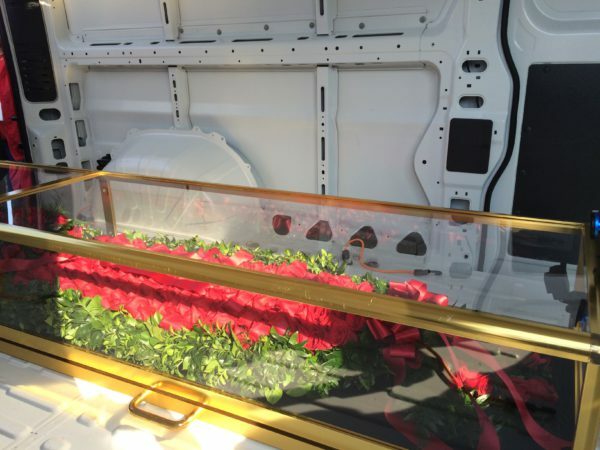 The red roses are sewn onto green satin. I was able to get this photo of the garland in its case before they unloaded it from the truck. Of course, there are hats, hats and more hats everywhere you look. I took lots of photos of the ladies in their hats, and you see a lot of men in their hats and crazy outfits, as well. Here are several pictures. 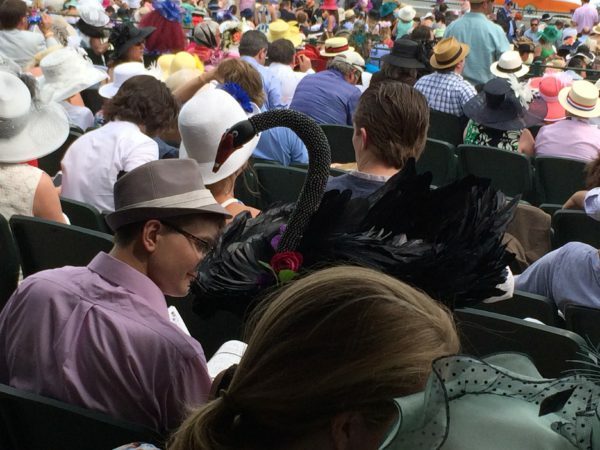 Look for the hat that resembles a black swan that had roosted on someone’s head. Notice the men in the very interesting matching outfits. The weather was almost perfect except for the humidity that we fairly new Arizonians hadn’t missed since we moved away from Florida. 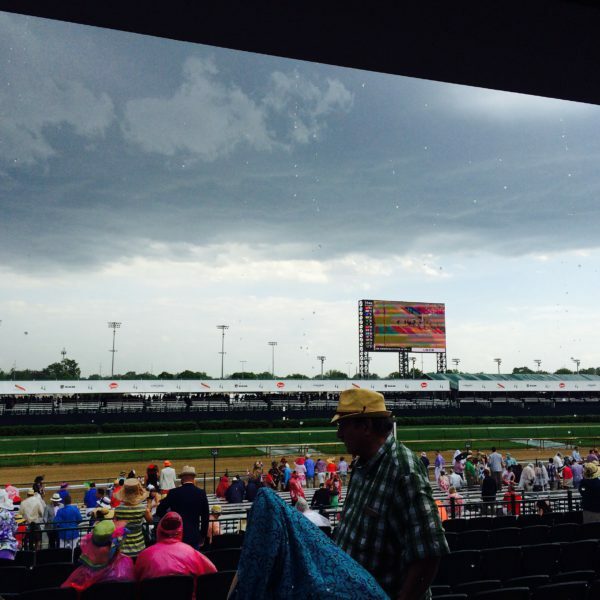 The humidity came from the threat of thunderstorms that materialized just before the turf race that preceded the Derby race. You’ll notice that in many of the photos there is plenty of blue sky, but those ominous black clouds rolled in, and here’s what it looked like from our covered seats. Hubby was thinking ahead when he booked our seats. I learned that 46% of the time there is rain on Derby day. The official drink of the Kentucky Derby is the mint julep. It’s a concoction of basically mint-flavored syrupy sugar water and bourbon served over crushed ice. Here’s my souvenir glass and a photo of folks lined up to get their mint juleps. 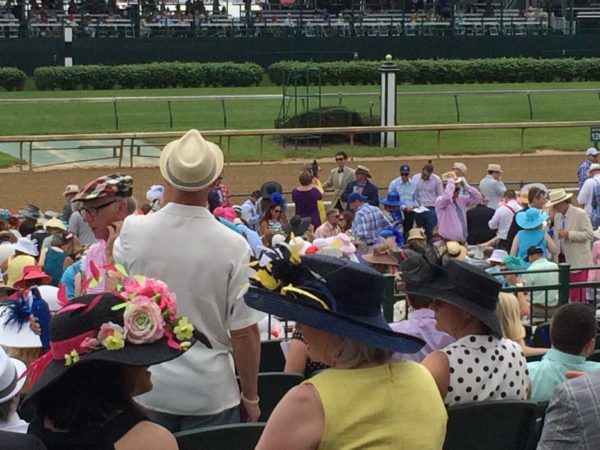 There are a total of fourteen races during the day—eleven before the Kentucky Derby and two afterwards. 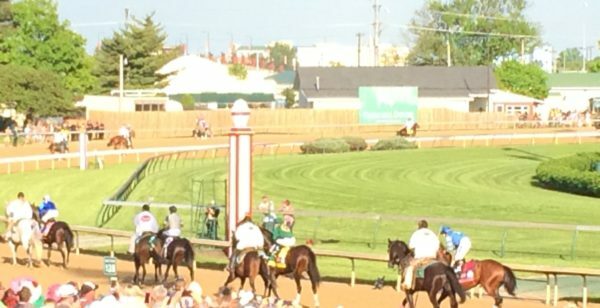 After a long day, the horses we came to watch in the Kentucky Derby appeared on the track for the post parade. These photos aren’t the best because there were a lot of people between the track and me. Here’s the starting gate, which was by the final turn near the end of the track where we sat. Here’s a picture of the start of the race. Unfortunately, since I’m short I got the back of someone’s big head ruining my picture. That was definitely a low light. He must have popped up just as I was getting ready to take my picture because that head wasn’t there when I first looked at the view finder. It would have been a great picture without that head in the way. Fortunately, I did get a pretty good video of the horses as they started down the back stretch. The finish line was a the other end of the race track where all the swells have seats. I hope you enjoy this twelve-seconds of the fastest two minutes in sports because it took a lot of work to figure out how to get it in this blog post. 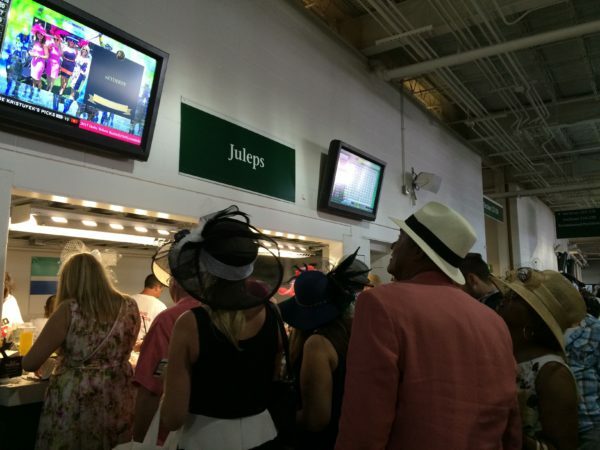 A horse named Nyquist was the winner, and that was our big day at the Kentucky Derby. Have you ever been to a big sporting event? 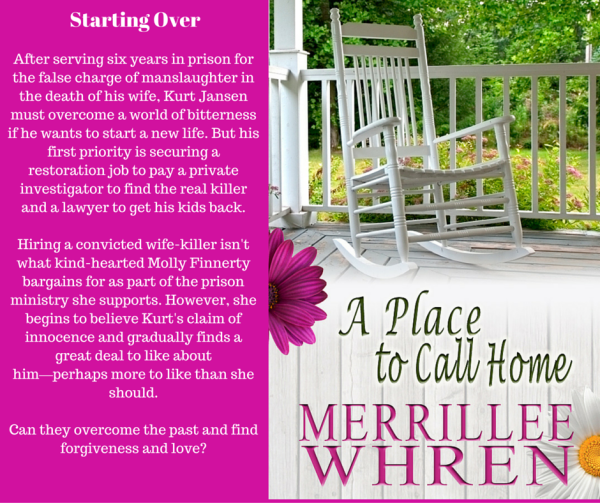 I’ll be giving away an e-book copy of my book, A PLACE TO CALL HOME, to someone who leaves a comment. I will draw the winners name on May 28, 2016 at 9PM PDT. Thank you for sharing your pictures and video. I usually watched the Kentucky Derby but missed it this year. Since reading the book “The Black Stallion” and other race horses including Man O’ War as a 12 year old, I have been hooked on watching the Triple Crown of Racing. Attending the Kentucky Derby is on my bucket list. kd, you’re welcome. I’m like you. I read books about horses when I was a kid, and that spurred my interest in horse racing. I hope you get to attend the Derby someday. Aside from attending many Redskins football games, I have been to the Preakness once. It was fun, but no hats. Thanks, Jill. One of my daughters lives in Baltimore. 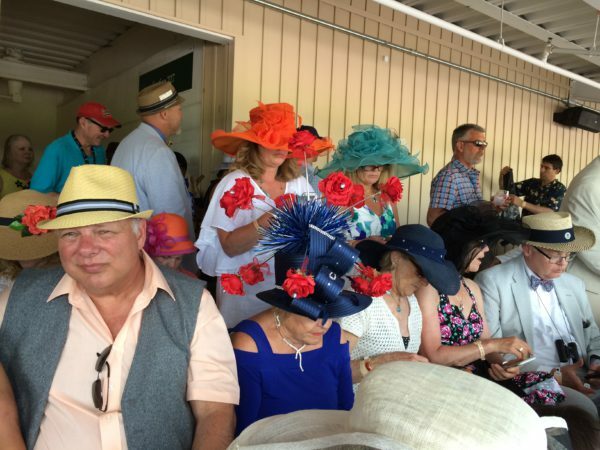 She’s never been to the Preakness, but she holds a Preakness party every year. This year that race was a muddy mess. Thanks for the follow up, you and your husband looked great- what fun dressing up:) The statue of Barbaro reminds me of Phar Lap, a famous Melbourne Cup horse. The biggest sporting event I have been to is a one day international cricket final at the SCG- “fancy” hats but of a very different sort than what you got to wear and see…!! Wemble, I’ve always thought cricket was an interesting sport, but I have never seen a live game. It was fun dressing up and seeing all the fashions. Thanks for sharing, especially all the hats. Reminds me when families dressed up for church and ladies wore hats to church, especially on Easter Sunday. Thanks for explaining the races. I am glad you and your husband enjoyed your outing. Renate, I too remember when people dressed up for church. We looked at some of the old family photos of the ladies in their hats. 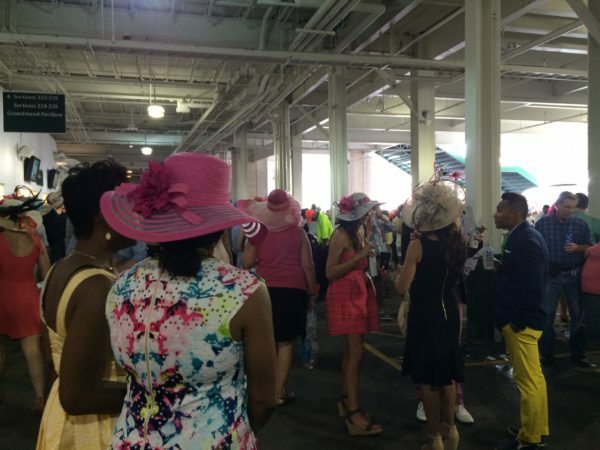 I had no idea the Derby was such a fashion event! Thank you for sharing your story and photos. Looks like a wonderful time! Thank you for sharing about your trip. I loved the pics and video. So exciting! I have attended regular college games (hockey mostly, some basketball), but nothing big. I don’t even know if I would enjoy such crowd. Priscilla, college games are always fun. There was a huge crowd there. People everywhere. I’ve never been to a large sporting event. I’ve been to a lot of soccer games when my daughter was playing soccer growing up. She gave it up for nursing school when she went to college. Diana, it’s always fun to go to your kids’ sporting events. Kim, you’re welcome. I’m glad you enjoyed them. An author I’m friends with had a book signing here in my home town. She had a Kentucky Derby hat contest, and I won! We watched the last race. It was sad to learn some horses died the previous day after racing. Would love to win and read your book. Gail, how cool that you won the hat contest. Yes, it was sad about the horses that died. The horses are so beautiful. Thank you for sharing your experience with us. It sounds like a fun and memorable trip. You’re welcome. It was a lot off fun. Thanks for sharing! Your video really showed the event well. Now I’m waiting to hear about a Kentucky Derby romance series! Valerie, you’re welcome. I don’t know about a series, but there will definitely be a book that involves the Kentucky Derby. Melissa, you’re welcome. Glad you enjoyed them. 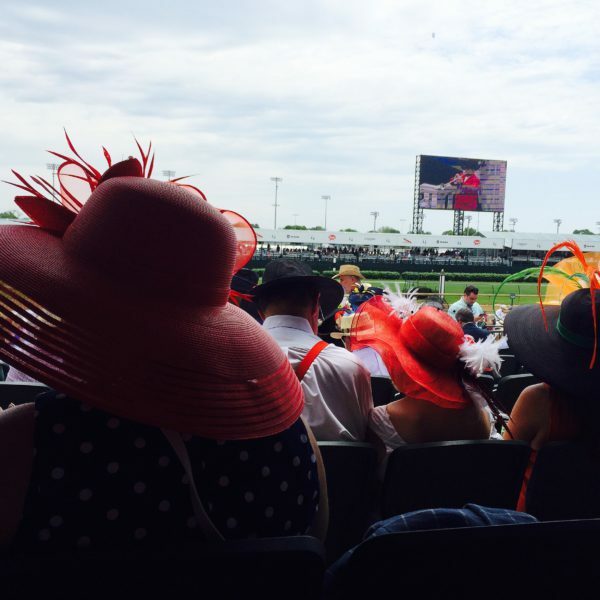 Loved the blog post and all the photos of the Derby. Linda, thanks for stopping by. Glad you enjoyed the post. Love seeing the sights and sounds of the day, including that hard to post video of the race! 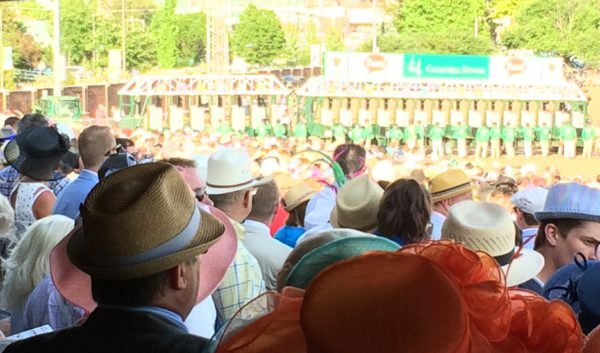 So glad that your hat was easy to pack – you look great in your Derby outfit. 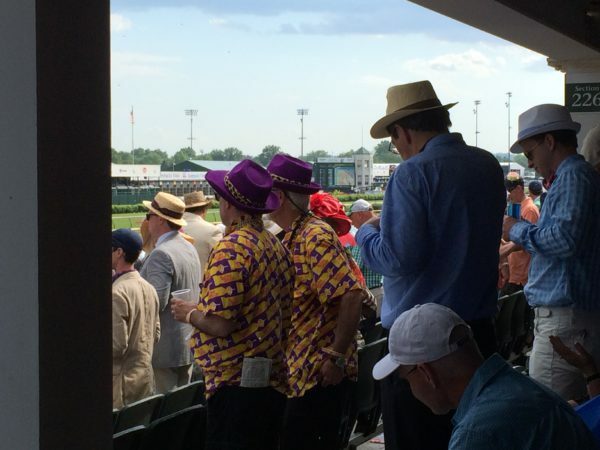 I’ve attended my share of pro-level sports events, but nothing that matches the Kentucky Derby. I did serve as a Super Bowl volunteer when the game was played here, but my role was limited to helping with parties and other special events during the week and not at the game itself. Mary, cool that you were a volunteer for the Super Bowl. We were season ticket holders and our names got drawn in the lottery to tickets. So we went to the game. Glad you enjoyed the blog. How fun! Those hats are great. I agree with other comments who dub you and your hubby best dressed. :) thanks for sharing your vacation with us! Elizabeth, thanks, and you’re welcome. The hats were definitely worth seeing. 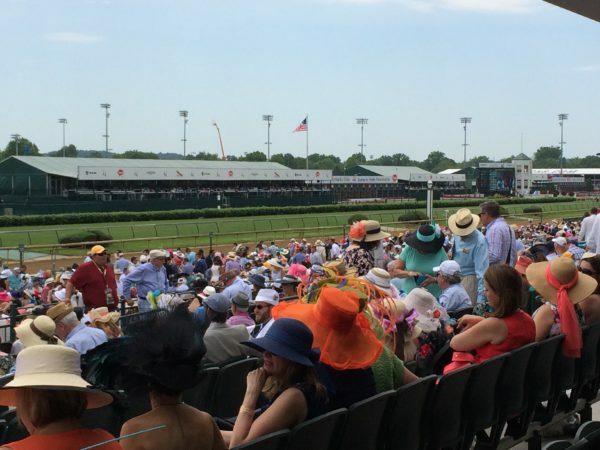 So, is your next book a Kentucky Derby book or at least set in Kentucky? Lee, I’m thinking of a story line that would include the Kentucky Derby. I so enjoyed your article about the Kentucky Derby. I have never been to a major sporting event, but I was thoroughly entertained by reading about your experience. It sounds like a lot of fun. I particularly liked all the hats. Linda, I’m glad you enjoyed my post about the Kentucky Derby. The hats were definitely interesting. 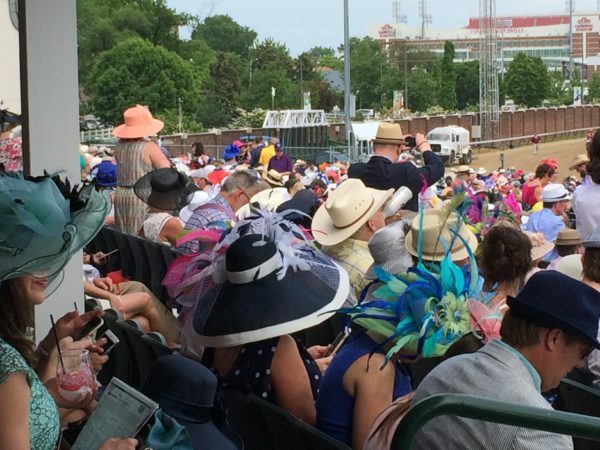 What a fun look at the Kentucky Derby! Thanks for sharing all the photos with us. I’ve been to a Kansas City Royals baseball game and many times to college sports, but never to a horse race. Pam, you’re welcome. Baseball and college sports are fun, too. It seems I’m so busy doing the stuff of life that I forget how it feels to do something exciting like you have done. I’m no author but I wonder if I put on a research hat (ahem) I might be able to think outside the box and go on some fun dates too! Diane, sometimes we just have to take time to have fun. This was definitely a fun date! I’ve always gotten such a laugh out of those hats, especially the black swan one…haha! And the couples with matching outfits are fun looking! Thanks for sharing all the pictures, makes me want to go just once to experience it first hand myself! Trixi, I’m glad you enjoyed the post. It was something I’d dreamed of doing since I was much younger. I’m glad I got to experience it. I hope you have a chance to go sometime. Joan, the hats are really interesting.